Congratulations to our Client TORRAIN for their feature in Retailing Insight Magazine! At TORRAIN, global consciousness and modern design principles unite in every one of their meticulously sewn designs. 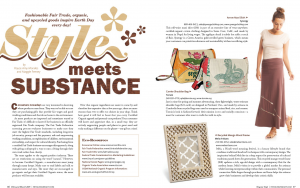 By upcycling feed bags, magazines, and even cement bags, they’re saving energy, reducing the amount of pollutants in the environment, and rediscovering the beauty in discarded items. Their clever creations are a thoughtful and functional addition to anyÂ wardrobe. Just in time for Spring and Summer the lightweight TORRAIN Shoulder Bags are an eco-chic way to rock your look with style and functionality! This classic crossbody with an overflap snap features a zip closure, interior pockets and an adjustable shoulder strap. Inspire Earth Day every day! Check them out at torrain.org!